324. Aug 23, 2005. New puppy with no time to rest and eat can become sick. 323. Aug 23, 2005. Hard bites at day 3. 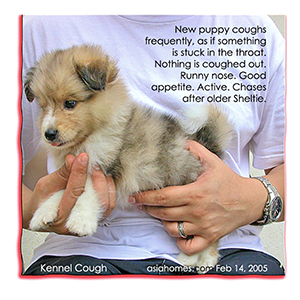 Use feed control and firm training to discourage biting. The Schnauzer does not pee inside the playpen because it is his den. 323. Aug 21, 2005. Innovative idea. 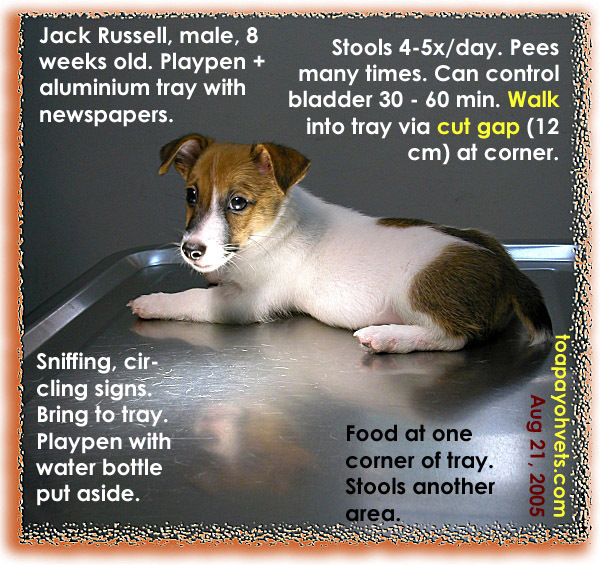 Gap in aluminium tray. No need to hop into tray. A gap for the Jack Russell to walk onto the pee tray. 322. Aug 21, 2005. Independent streak. No need human company at night. 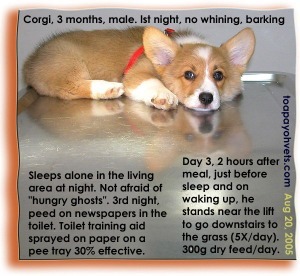 The Corgi sleeps alone and is not afraid of the "hungry ghosts". 321. Aug 21, 2005. Barking either to clean cage or wants to play with older Dachshund. 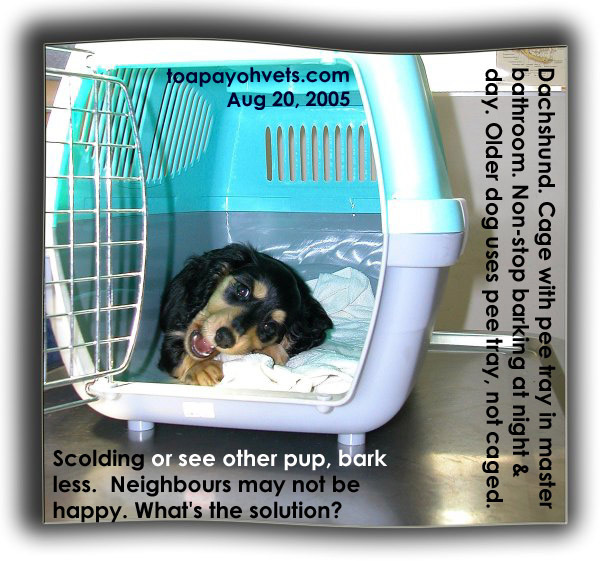 The Miniature Dachshund barks to get out to play or for a change of soiled papers. 320. Aug 20, 2005. 4 weeks in playpen + newspapers. Still not paper-trained. What's the solution? The pug was still not paper-trained after 4 weeks. 319. Aug 19, 2005. 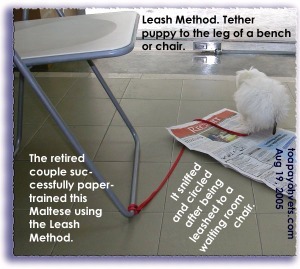 A retired couple successfully paper-trained the Maltese using the leash method. 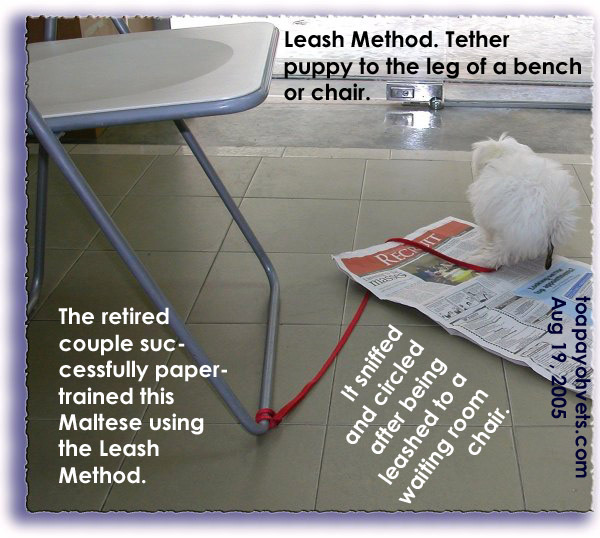 The leash was tied to the leg of a heavy bench. The puppy loved to hide inside and below the bench. It is a den and provides privacy and security. Leash method is an effective method for the retired couple 318. Aug 18, 2005. Experienced dog owner. Older dogs' toilet area used by the new puppy. Note very well groomed and cared for coat. No rashes. Tired. Rest on consultation table after the 3rd vaccination. Can you teach young dogs old tricks? 317. Aug 18, 2005. 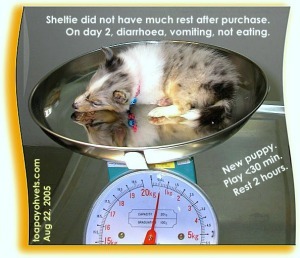 The pet shop operator did not advise toilet-training. 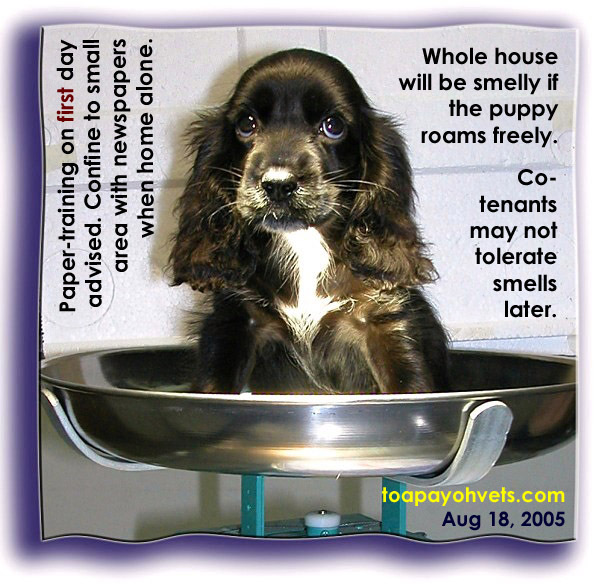 The owner thought that toilet-training can be done later when the puppy grows older. Jumped when home alone. Very painful left hind leg. 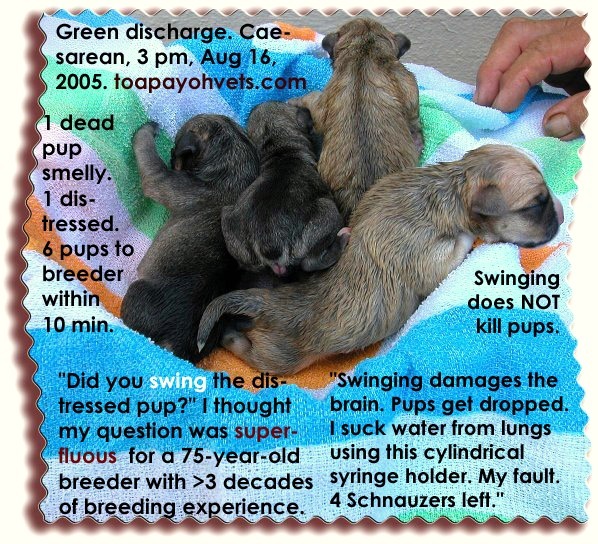 Use a puppy carrier when going out. 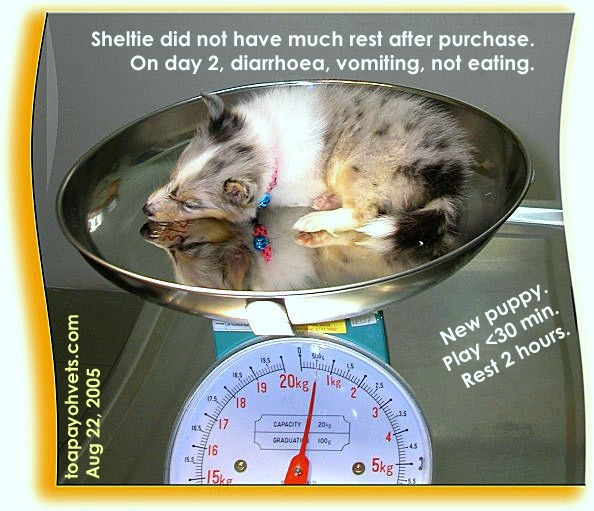 Toilet-training must start on day 1 after purchase, not later. 316. Aug 15, 2005. 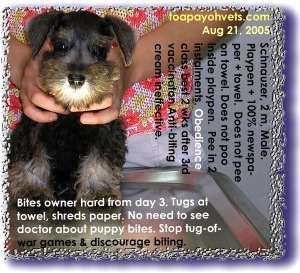 "See one Schnauzer had no tail. 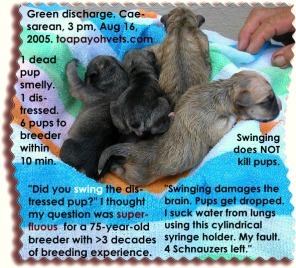 This is because I clipped the mother's back," the breeder said as a matter of fact and > 3 decades of experiences. Swinging kills the puppy. 315. Paper-training the apartment puppy. 314. Aug 15, 2005. 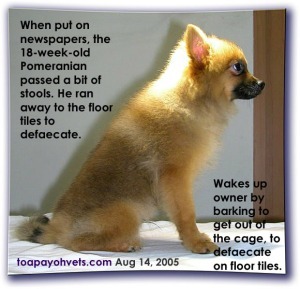 "Accidents" occurred because the apartment's tiles still had the urine smell attracting the chihuahua to pee on them. Mopping did not help. Vinegar:water 1:3 will neutralise the smell. The 5-month-old still has accidents. 313. Aug 14, 2005. 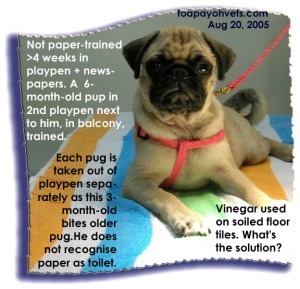 The tall lady owner complained that Yogi was still not paper-trained at 18 weeks old. He just ignored papers and used the floor tiles anywhere in the apartment as toilet. What's the solution? The Pom pees only on tiles. 312. Aug 14, 2005. 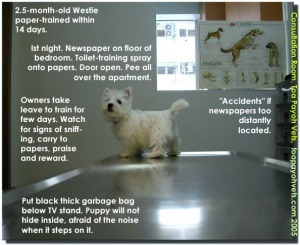 Westie paper-trained fast because it had training from day 1 for the next few days. 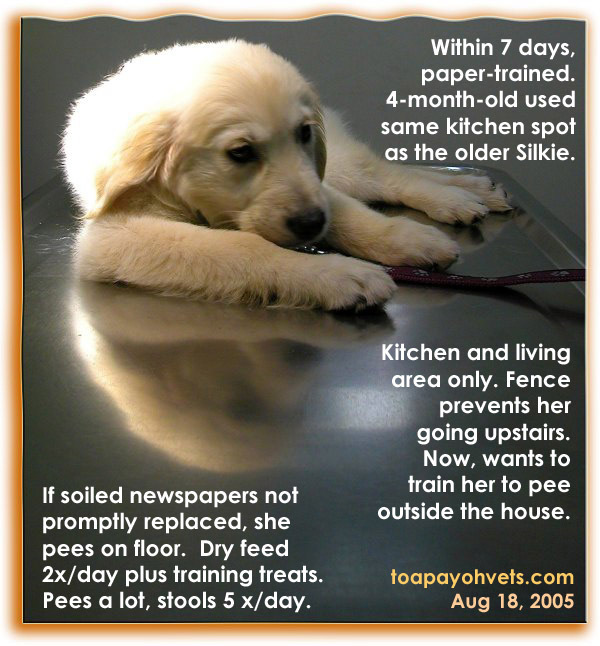 Take leave to do toilet-training.